I have previously described the major epidemic of coronary heart disease (CHD). Strictly speaking it was a pandemic as it was international, occurring in all continents simultaneously. It has been described clearly in the UK and in the USA. There is good similar data appearing from Canada. The data have been based on recorded death rates. The reason is that death is very distinct and a very definite end-point to life. In respect of CHD it is preceded by a well-defined clinical picture of sudden collapse followed rapidly by death, perhaps with severe constricting chest pain. Deaths from CHD have been quite clearly defined, with probably little diagnostic error. CHD is fundamentally a pathological process that develops insidiously, without the knowledge of the “sufferer”, until a clinical event occurs after a latent interval of perhaps several decades. 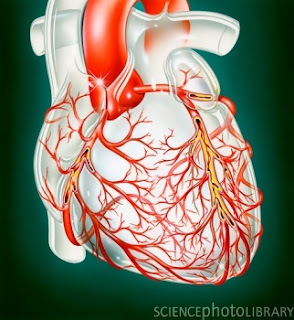 The disease is one of atherosclerosis, a low-grade inflammatory process with consequent obstruction of the coronary arteries, found on the surface of the heart. It is actually a bit more than atherosclerosis. CHD is usually patchy within the coronary arteries, with "plaques" that are unstable with possible surface ulceration. It is on the surface of these ulcerations that blood clotting (thrombosis) can occur, with sudden complete occlusion of a coronary artery. congestive heart failure – narrowing of coronary arteries over a long period of time, without chest pain but reducing blood flow to the heart muscle, as a result of which the heart does not function adequately and swelling of the legs occurs. 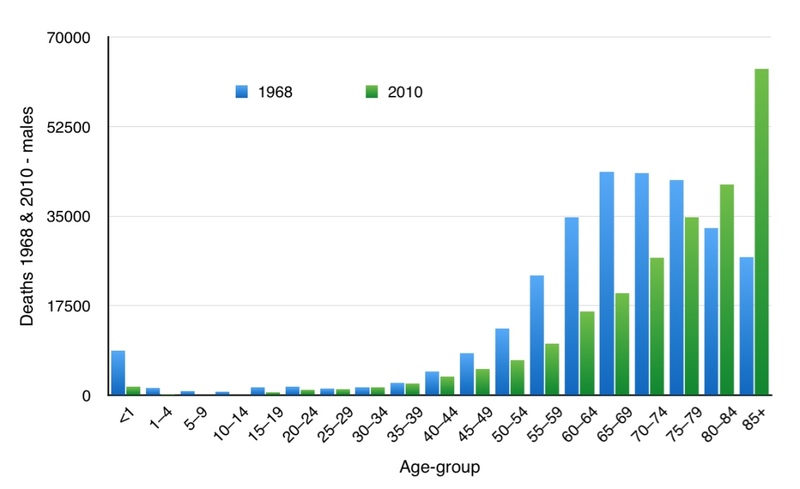 The incidence of (MI), fatal or non-fatal, can also be calculated, as the number of new cases (events) occurring per 100,000 population each year. This is usually obtained from hospital statistics which are reasonably reliable. One of the successes of the UK NHS with its centralised bureaucracy is its ability to collect comprehensive national statistics. But not all people who develop MI are admitted to hospital and admission rates might vary between localities or countries. A further and serious problem is that the diagnostic criteria of MI have changed in recent years. ECG changes used to be an integral part of the diagnosis of MI, and I spent many hours learning about ECG interpretation. But now it is stated that the ECG shows no abnormality or no change in up to 75% of cases diagnosed as MI (called NSTEMI – Non ST Elevation MI). It has been necessary to develop a new test of “highly sensitive troponin” so as to identify such very minor and not dangerous episodes of MI, which in the recent past would not have been identified. In the past the frequent diagnosis of "Chest pain ?cause" had an excellent prognosis. This means that during the past ten years it has not been reliable to look at the incidence of MI because of such a major change in diagnostic criteria. When we try to identify the presence of an underlying disease that might not have symptoms, there is no clear and recognisable event at the onset. This would apply to diabetes and hypertension, as well as CHD before clinical features have emerged. We can take a “snap-shot” of a fairly small sample (but the bigger the better) of the population and determine how many people have the condition at any one time. This is the prevalence. Defining diabetes and hypertension is a difficult process as there are no clear cut-off points between the “normal” population and those who are considered to have the “illness”. The concept of illness implies that the “sufferer” is at a biological disadvantage in respect of early death or disability. During recent years the diagnostic thresholds of many conditions (MI, diabetes, hypertension, kidney failure) have been reduced so that by definition more people have the "illnesses" and fewer people remain “normal”. This has been been called “disease-mongering”, expanding the range of a disease and thereby creating “ill” people out of the normal population. This is of very important commercial advantage in many countries to doctors and other health care providers, and also to pharmaceutical companies. There is a significant cost to those who pay, but from the viewpoint of the providers this is someone else’s problem, and of course it is "in the best interests of the general population"! “Monger” is an old English term for someone who creates or sells things, such as an iron-monger or a fish-monger. It is also used in the expression “war-monger”, someone who creates wars. Disease-monger is thus someone who creates disease by simple change in definition. A good example is the new “disease” of female sexual dysfunction, created by medical “experts”. The introductory conference was funded by the pharmaceutical company that was developing the “treatment”. Pre-diabetes, pre-hypertension, and even “high cholesterol” are also non-diseases. They create significant detrimental effects on the innocent “sufferers”, such as increased insurance premiums, increased medical assessments and pharmaceutical interventions, unnecessary dietary restrictions, and of course great anxiety. These activities give no benefit to the great majority. With many conditions the process of testing is easy – a blood test for diabetes or kidney failure, blood pressure check for hypertension. When it comes to the recognition of sub-clinical CHD the process is more difficult. Ideally coronary angiograms are necessary for the identification of CHD, being highly specific (very few false positives – when the test is positive it is strong confirmation of the presence of disease) and also sensitive (very few false negatives – if negative the disease can be confidently excluded). 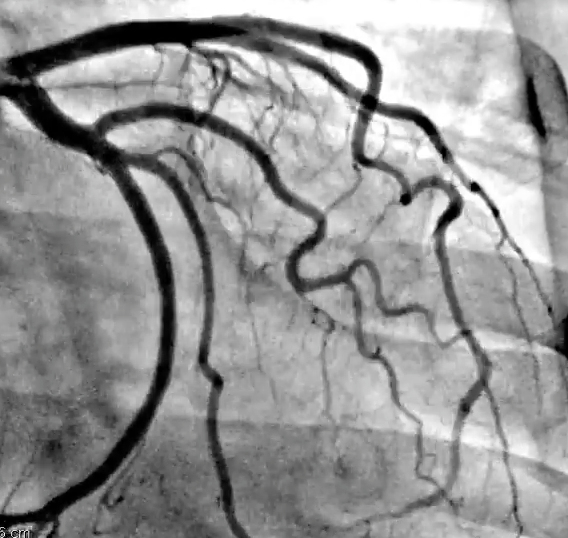 But coronary angiograms are invasive, potentially but only rarely dangerous, expensive, and not acceptable as a means of case-finding. 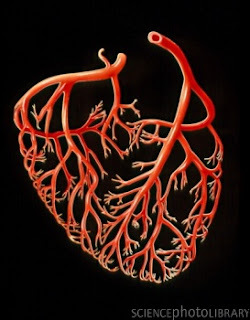 It is only when clinical disease has occurred that coronary angiograms are performed. CHD is based on an inflammatory process within the coronary arteries, and as with chronic inflammation anywhere in the body, after many years there can be deposition of calcium in the inflamed tissues. 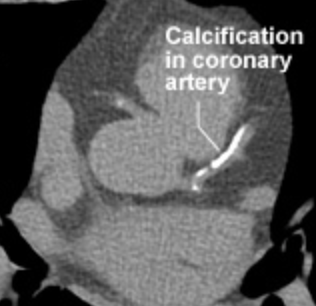 The calcification can be identified on a CT scan and this can be used as a method of detection of CHD. However CT scanning is also an expensive procedure and it gives a high level of radiation. It is therefore not applicable for population screening, especially as the detection of calcium in an asymptomatic person would not lead to any useful intervention. It might result in higher insurance premiums. Finally, autopsy studies can be used to identify CHD and assess its frequency (prevalence) within the population. This is not very useful at present as many fewer people die young and autopsy rates have diminished considerably. Those who do die young and on whom autopsy rates are high are soldiers. It was noted during the Korean War (1950–1953) that autopsies performed on soldiers killed in conflict (and also young civilians killed in road accidents) frequently showed atherosclerotic change and evidence of CHD. This led to the realisation that the disease commenced as early as childhood. It appeared that there were several decades between the onset of the disease process and the occurrence of clinical illness. During the war in Korea, (1951–55) almost 80% of young soldiers killed in action were shown at autospy to have evidence of CHD, and almost 20% to have it in a severe form. This in itself is remarkable and at the time was rather frightening. It was evidence of the long latent period between pathological evidence of asymptomatic disease and its clinical expression in future years. In both rheumatic heart disease and syphilitic heart disease there also is a long interval between the onset of the disease process (an infection) and the onset of the clinical illness. It has been possible to assess the prevalence of both as the conditions could be diagnosed by clinical examination. Auscultation of the heart would lead to the identification of damaged heart valves, characteristic of both rheumatic and syphilitic heart diseases, and a blood test (Wassermann reaction – WR) has long been very useful in the recognition of the late effects of syphilis. We have seen in previous posts details of the epidemic nature of deaths from CHD (= MI). Evidence from US soldiers killed in action are available not just from the Korean War, but also from the Vietnam War (1968–1975) and the Iraq and Afghanistan Wars (2000–2011). 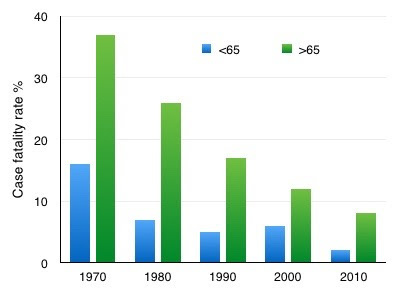 The results show a major reduction in the prevalence of atherosclerosis and CHD during the time of these three wars, from 1968 until very recently. This can be seen in Figure 5, and I find it to be the strongest evidence of all that we are experiencing the end of a very serious epidemic. The important thing is that early evidence of CHD had become quite uncommon (less than 10%) by the early 21st century. The soldiers killed would have been born during the 1980s, a time when exposure to the causative micro-organism had almost passed and when herd immunity within the population was high. Figure 5: CHD and severe disease found at autopsy in US servicemen killed in action. Such data are not available from the early stages of the epidemic, from the First and Second World Wars. During WW1 the clinical epidemic had not started and in WW2 there was no major interest in CHD as it was not at the time appreciated as being an epidemic or a major public health problem. One thing is clear – that in the early years of the 20th century pathologists conducting autopsies were not aware of a significant prevalence of CHD. It was clearly not a significant cause of fatal disease. But there is historical evidence of atherosclerosis, the pathological process that underlies CHD. 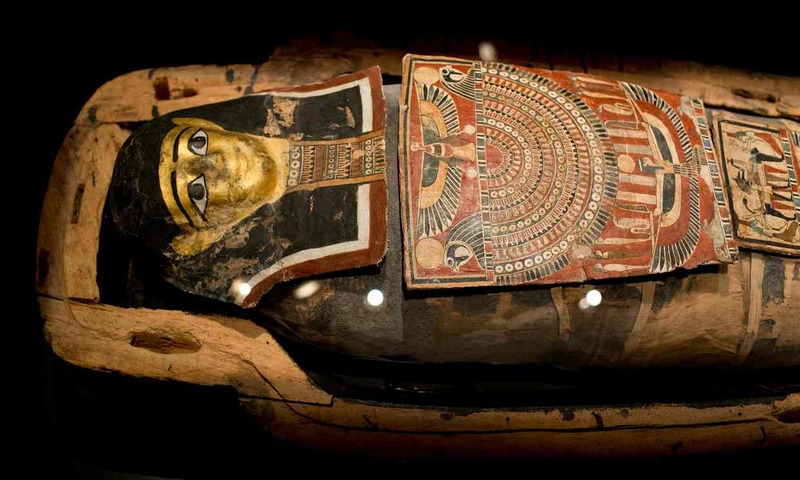 Egyptian mummies, about 3,500 years old, have been shown to have evidence of atherosclerosis. One was the Pharaoh Merenptah, who died in the year 1203 BCE. Soft tissues of the unpreserved body do not survive, and there is serious loss of detail even in mummified bodies. However in chronic inflammatory diseases there is often deposition of calcium in the diseased tissues, and this will remain in mummified bodies. The calcium deposits can be detected by X-ray techniques, especially CT scanning. Although not in general use as a method of screening, it has been used in the scientific investigation of mummies. This has resulted in the detection of arterial disease in Egypt 3,500 years ago. The investigators were of course experts in Egyptology and no doubt had only very basic knowledge of CHD. They speculated that these important Egyptians whose bodies were preserved for posterity must have had “atherogenic diets”. Of course we now know that CHD is not a dietary disease and that an "atherogenic diet" is just a popular myth. But what does the finding from the mummies mean? Was there an epidemic of CHD in Egypt 3,500 years ago? 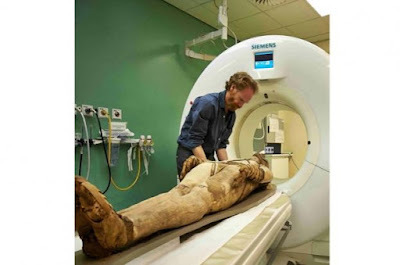 This is possible but it cannot be concluded from a sample of just a few mummies, especially as the hearts had been removed at death and were not available for examination. Have atherosclerosis and CHD been present continuously since that time? There is no way of knowing as there are insufficient bodies from the past with preserved soft tissues that can be investigated. It is distinctly possible that low-grade atherosclerosis has been present in some individuals during many centuries, in a way that has not had a significant clinical impact. "Hardening of the arteries" has been viewed as a degenerative condition. This might be reasonably correct when applied to the very elderly, but the epidemic of CHD was most certainly not degenerative. It was something very different. 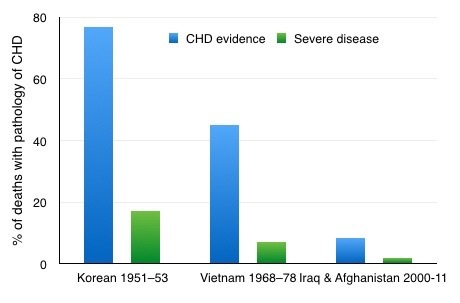 We have seen the prevalence of atherosclerosis in young US soldiers killed in action, that it was high in the years of the CHD epidemic, but only minimal in more recent times. It is the persistence of low-grade atherosclerosis in a mild form that suggests that although it might be present as a background disease, the epidemic of CHD during the 20th century was something different and something very special. A previous Post has explained that the only sustainable cause of CHD must be a micro-organism. But why one? Is is possible that several micro-organisms can cause arterial inflammation and the development of atherosclerosis? 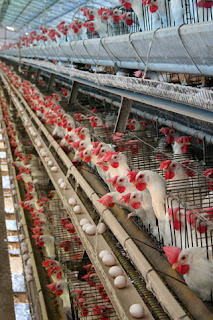 This is suggested as the “dirty chicken hypothesis”, that several micro-organisms might be causative. The suggestion is that especially in poor people, who have the highest incidence of CHD death, a number of childhood illnesses create an illness burden that suppresses growth. This can be viewed as similar with chickens and other domesticated animals. 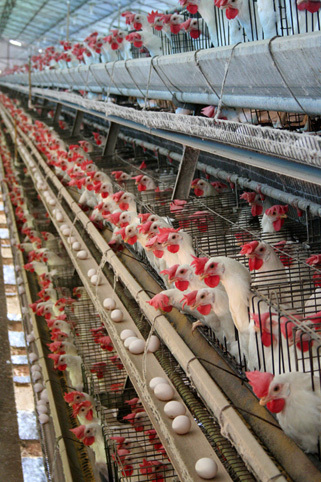 Growth of these animals destined for human consumption can be stimulated in a very significant way by giving them large amounts of "routine" antibiotics, presumably supressing low-grade infections. It is suggested that in humankind, the inflammatory burden leads to atherosclerosis and CHD. Although a large number of micro-organisms might and probably do cause low-grade atherosclerosis, this is not the same as causing a world-wide pandemic that became the most important cause of death during the 20th century. This would require a very specific micro-organism. It is well-known that micro-organisms are continuously present in the blood (bacteraemia). Although they are not visible on microscopy or even on culture, they can now be recognised (but not yet clearly identified) by DNA testing. The micro-organisms must have invaded initial body defences - the skin, the respiratory tract, the gums, and the intestinal tract – in order to enter the blood. The body has a secondary line of defence processes in the tissues. Bacteria in the blood can invade the walls of the arteries through tiny blood vessels called vasa vasorum, the “vessels of the vessels”. This is well established as the way in which syphilis causes vascular disease, “syphilitic aortitis”. It could and almost certainly will occur with a variety of micro-organisms, but the invasion is halted by immune mechanisms in the arterial wall. The immune reaction involves inflammation, a defensive process that is within the experience of all of us. This will ideally eradicate the microbial invasion. If the process is incomplete then it will contain the invasion with continuing low-grade inflammation. The initial part of the defence process is low density lipoprotein (LDL-cholesterol), which is known to have important antibacterial effects. 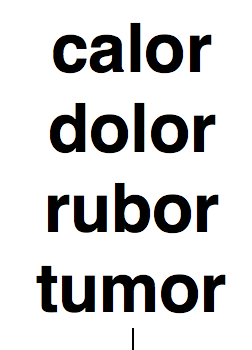 The inflammatory process is traditionally characterised by "calor, dolor, rubor, tumor", meaning high temperature, pain, redness, swelling. Although these features are obvious when inflammation is in the skin, they might not always be obvious when in internal tissues. The important feature of inflammation in the coronary arteries is "tumor", the swelling that is recognised as a "plaque". It is rich in cholesterol as cholesterol is an integral part of the gradual inflammatory process. The greater the expression of cholesterol by an individual, the greater the swelling, and thus the degree of stenosis, narrowing, of the coronary artery. This is what happens with familial hypercholesterolaemia. Low-grade inflammation of some arteries is likely to be common, just part of life in the elderly and only rarely causing clinical problems. However if the immune processes are defective, or more importantly if a highly virulent micro-organism is encountered, the defence mechanisms will be overwhelmed, with clinical effects at a younger age. Although a background of low-grade atherosclerosis might have been due to a variety of micro-organisms, the epidemic of CHD deaths in the 20th century was clearly due to a new and highly virulent micro-organism. Deaths have been much more likely when immunity has been sub-optimal. The micro-organism concerned has not yet been identified with confidence, but there has not been a major effort to do so. What is likely to happen in the future? The epidemic is virtually at an end and we are already in the future. The situation now is that CHD continues but in a very much milder form than previously, and in much older people. There are episodes of MI and these can be fatal, but almost entirely in the very elderly. The great majority of events are not dangerous and there is no abnormality on the ECG. They would not have been recognised a few years ago, before the re-definition of MI and the introduction of very highly sensitive blood tests. 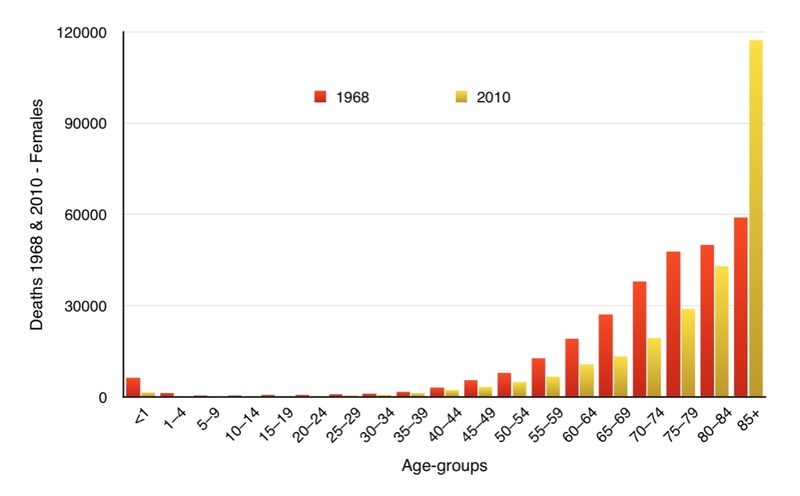 It is likely that the pattern of CHD deaths has been a cohort effect. People alive between an indeterminate year early in the 20th century and about 1970 would have been exposed to the causative micro-organism, and they started dying from CHD/MI in 1924. The lead time for CHD, what might be called the latent or incubation period, can be several decades. We have no idea what this latent period was at the onset of the epidemic, as the acquisition of the micro-organism did not appear to be associated with a clear illness. The initial infections of syphilis (genital sore) and rheumatic fever (sore throat and joint pains) were usually obvious, followed by a long latent interval before the recognition of heart disease. The latent interval between the acquisition of the causative micro-organism and the development of CHD could initially have been just a few years, with initial exposure immediately after World War One. Could the causative organism possibly have been the one which caused the 1918 influenza pandemic (Spanish flu)? 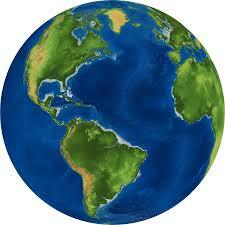 This caused between 20 million and 50 million deaths in the 500 million people affected. As a later effect after a latent interval it is thought to have been responsible for a subsequent 5 million cases of Encephalitis Lethargica, a very serious sleeping sickness (a disease of the brain). The peak of the epidemic was reached in 1970. If the peak age at death was 70 years, then those dying in 1970 would have been born in 1900. We know from Korean war deaths that the disease process was established in early adult life. Remember that cigarette smoking brings forward death from CHD by 10 years. My father and mother (non-smokers) had both led extremely healthy lives but died as the result of CHD/MI in 1994 and 1997. They were born in 1910 and 1913 and so the time sequence fits into this pattern. CHD / MI is now a different disease from what we experienced in the years around 1970. It now has a very much lower mortality rate than twenty years ago. This is clear from USA data, in Figure 10. 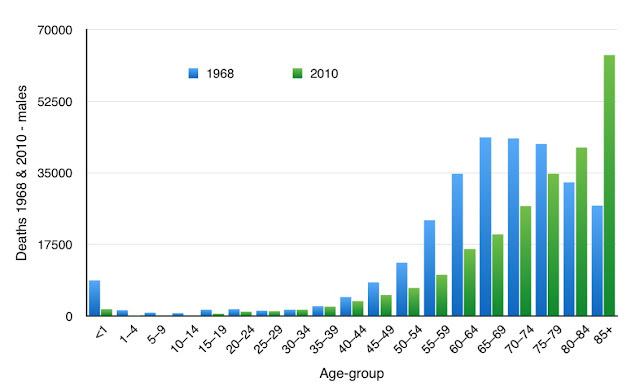 Remember that there were very few effective treatment opportunities between 1970 and 1990. It now affects an older age-group, but as mentioned, this is likely to be a cohort effect. Most of those dying now could have acquired the initial infection in the 1920s or 1930s. They are now the frail very elderly, who have little physiological reserve, and are at risk of death from any minor illness. The main cause of death would be "old age" but there is reluctance for this to be put on a death certificate. Figures 11 and 12 show a dramatic change in age at death since the peak of CHD deaths, comparing 1968 with 2010. It is much more obvious in men (Figure 11) than women (Figure 12), as CHD death rates were much higher in men. The dramatic clinical features of MI with a very obvious diagnosis, high complication rate and high early death rate (such as I described was the scene in 1970) are now seen only very rarely. Treatment is better today, but as shown in the long-term international MONICA study, the much reduced death rate from CHD is much more due to a reduced incidence rate of events rather improved survival from them. Access to coronary angiography and stent insertion was very restricted in the final years of the 20th century. This has changed in the 21st century and availability of the service is now excellent. Although it would have been wonderful had it been available in 1970, it is of much less therapeutic value today. Minor degrees of coronary artery atheroma are readily identified, but the problem is whether these are of any clinical importance. The 20% narrowing of a coronary artery will not lead to any reduction of blood flow. If discovered in a 70 year-old, it can be expected to progress very little during the remainder of life. There is now concern that too many stents are being placed in very low risk individuals for no clinical benefit. This is of particular concern in countries in which the cardiologist is paid for each procedure. It is of less financial concern with a salaried service as in the UK. However it all is part of the over-medicalisation of society. Doctors generally do what they have been trained to do,(encouraged by the medical manufacturing industry), and so a cardiologist highly skilled in placing stents will place stents, even though the indications were not as strong as in the past. There has been an epidemic / pandemic of deaths from CHD during the 20th century. The decline since 1970 has been a combination of decline of deaths, a much-reduced frequency of events, the change to a much milder form of the disease, and a much-improved survival following an event. What has brought about these remarkable improvements? A decline of the cause is the obvious first thought. As discussed in a previous Post, the only possible cause that fits in with the facts is a micro-organism, the precise identification of which is not yet established. We can ignore dietary (chemical) factors, as despite a great deal of media attention, diet shows no consistent relationship to CHD. A micro-organism does not “go away”, and trillions of micro-organisms cannot all simultaneously mutate into a less virulent form. The end of an epidemic is brought about by the population developing immunity. And so it is with CHD. There is now widespread immunity, and hence the epidemic is effectively at an end. There is great deal of information demonstrating the importance of immunity, or lack it, in CHD, and this will be the subject of a further Posts. Thank you Dr.Grimes for sharing all this information about coronary heart disease with us. It's good to know what's actually happening and how it is happening! !